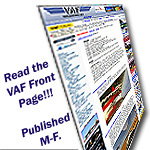 Each time someone follows this link to VAF Forums and registers as a new member, your referral count will be incremented by one. The number of referrals you have can be viewed in your profile. Your administrator will have more information on any prizes or rewards that may be given out for referrals. Please be courteous when promoting VAF Forums by not spamming other web sites with your referral link just to gain referrals.